The temporomandibular joints (TMJ) are complex and richly innervated joints located on either side of the face, just above the jaw. The term TMJ is also used as a diagnosis for patients who experience pain or dysfunction of these joints. 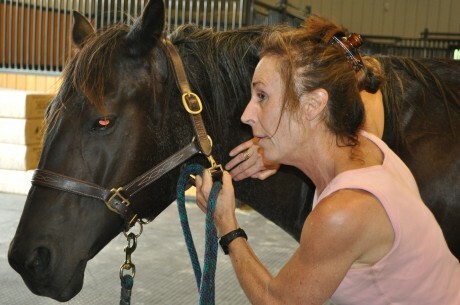 Horses are particularly dependent on the proper functioning of these joints because of their specific anatomy. The upper joint in the equine mandible allows the jaw to drop down. The lower mandibular joint permits the jaw to slide forward. These biomechanics allow for the appropriate movement of the jaw, and the ‘grazing’ ability of the horse. The TMJ communicates extensive proprioceptive input to brain, providing balance information for the head, jaw and neck, as well as neutralizing premature striking of the teeth. TMJ problems can result from any number of factors, including lack of appropriate dental care, misalignment, and degenerative wear and tear, to name a few. Observable indicators of TMJ problems include tossing of the head, stiffness in the neck, difficulty chewing or accepting the bit. Severe cases can even result in bucking. Horses are grazing animals, which keeps their incisors worn naturally and maintains healthy functioning of the jaw. Be sure to allow your horse to graze, if possible. Asses the alignment of these joints, and if needed, be sure to adjust them. Check the incisors for appropriate alignment. Have their teeth floated regularly. TMJ can be a painful and debilitating condition, yet with a little preventative care, can be easily and effectively managed. Have a comment? Join the conversation.